Among all those Tamil songs mentioned there I am familiar only with 'Om simoham' from Naan Kadavul! But I am familiar with both the Hindi songs. Considering all three songs, this Raaga should be awesome! 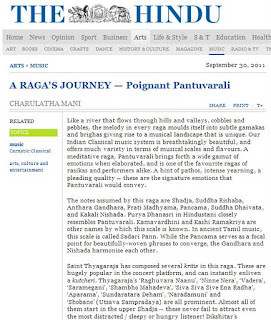 simply awed and admired your article on Panthuvarali raga . all the msv and ilayaraja songs are my favourite . when i never heard about pithamagan ' piraye ' song . simply stunned and stumped on raja ;s skill and amazed by your knowlege too. thanks a lot and keep it up your essays which are simply superb and knowledgeable . I thumbed a ride through the said Hindu Newspaper and got elated at seeing your performance on Pantuvarali. reception table endorsed and said that the programme was for 90 minutes.